Pushkin Hills is an open air museum preserved in all its 19th century glory around Alexander Pushkin’s family mansion in Pskov, 120 kilometres from Moscow. Sergei Dovlatov worked there as a tour guide for a short period, just as his central character, Alikhanov, does in his novel, Pushkin Hills. Like Alikhanov, Dovlatov was a struggling writer who could not get published in Russia, eventually immigrating to the USA in 1979 where he wrote a number of novels until his death in 1990. In the last couple of years Alma Classics have issued translations of three of his novels: The Suitcase, The Zone, and, most recently, the aforementioned Pushkin Hills. As well as allowing an extended meditation on Russian writing, the museum also reflects the state in its lack of authenticity. A portrait turns out to be of someone else, a duelling pistol is simply of the period. When Alikhanov asks one of the curators whether the objects are authentic, she replies, “Is it important? However, while this creates a certain amount of narrative tension, the novel as a whole reads more as a surreal succession of eccentric characters. Alikhanov also gives as a reason for remaining in Russia that he detests “active behaviour of any kind” and that he lives in the “passive voice”, and that very much reflects his function as the protagonist. Much of this passivity is create by alcohol – at one point a character forecasts that vodka will bring about the end of Soviet rule. 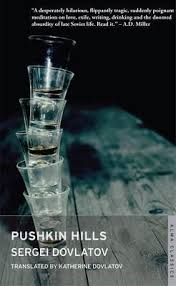 (I’ve always wondered whether the astonishing drink-intake of Russian novels is a genuine reflection of life or an elaborate in-joke by Russian writers). That’s a line, you feel, which could have come from Pushkin himself. You are currently browsing the archives for the Sergei Dovlatov category.